Gas smokers are becoming increasingly popular these days. This can be attributed to a variety of factors- right from their ease of use to the high degree of versatility that they offer. While these do have a range of advantages, there is another side to gas smokers as well. Let us look at both the pros and cons of having a gas smoker to decide whether they really are a great purchase or not. Majority of the gas smokers are of the cabinet-style design, which will look similar to a small locker. There are models of other designs as well, such as the Weber Genesis 6532001 E-330. The design of these smokers is simple- with a gas burner connected to the fuel tank at the bottom. The pan/tray for sawdust/wood chunks/smoking chips will be above the burner, and in between these two will be the water pan for keeping it cook during a large cooking process. While most gas smokers run on propane gas, a rare few can be used with natural gas as well. In such smokers, there is a hose supplied with the unit that connects the smoker to the natural gas outlet. Since these smokers rely on the propane or natural gas exclusively, they are portable as well. Gas smokers come with a high temperature range, which allows them to be used for a range of purposes, including smoking, grilling and cooking. The biggest advantage that you get with gas smokers such as the Weber Genesis 6532001 E-330 is that they are easy to set up and start. 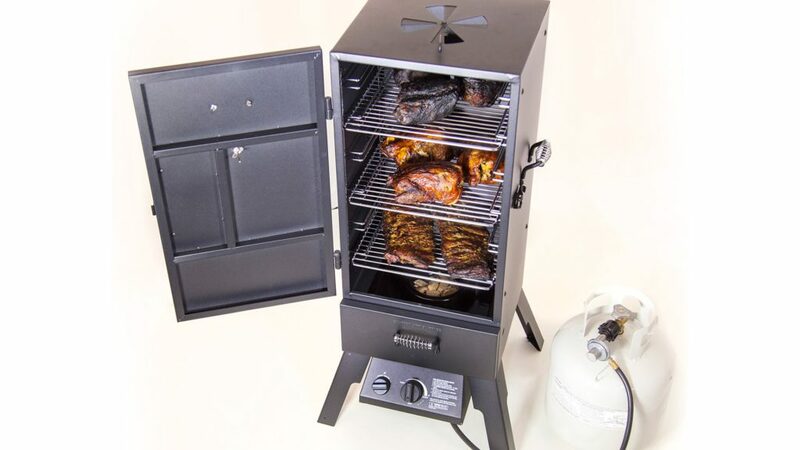 For instance, the Camp Chef Smoker 18″ Smoke Vault, similar to other gas smokers, has a push-button ignition. This means that all you have to do for igniting or killing the fire is press a button (or turn a knob in other smokers). There is no need to add coal or do anything else as there is with other smokers. Controlling the temperature is also done by simply turning the knob. Gas smokers have a broader temperature range than other variants. Since these rely on gas, they can be transported with ease. Propane smokers come with a very small footprint, which makes them ideal for those areas where space may be an issue. Propane also burns with greater efficiency and cleanly, which means no soot deposits on the food. Maintaining the temperature is easier in a gas smoker as compared to other types of smokers. Regulated and consistent temperature is the key to maintaining the right temperature-, which is what makes gas smokers such as the Camp Chef Smoker 18″ Smoke Vault ideal for making your favorite dishes. While there certainly are many upsides to having a gas smoker, that is not all. One of the biggest disadvantages that you will face with a gas smoker is that there the method does not impact any unique flavor to the dish- something that true gourmet lovers can get with other variants. In addition to that, propane also burns out faster. Thus, you now know what makes gas smokers such as the Weber Genesis 6532001 E-330 a great purchase, and where to they lack. While there certainly are many pros to having a gas smoke such as the Camp Chef Smoker 18″ Smoke Vault, but just like everything else, there are certain disadvantages as well. Before finalizing your purchase, ensure that you take sufficient time to judge what works and does not work for you. This will ensure that you buy the type of smoker that goes with all your needs. If needed you can compare smoker grills easily on the web. With an informed decision, you will surely get a smoker that is not only ideal for your needs, but also gives you delicious results for years to come!